« Hiking in the Himalayas? Check. Another week in India, another week of adventures. One week ago was Vinayak’s (our host brother) birthday! He turned 13 – big day. We had a family dinner on Friday, and got to meet his aunt and uncle. We had tons of food – and we had made a birthday card for him (just construction paper and crayon) and he hung it up on his wall! So cute. He got the presents he wanted too – new cricket clothes, a new stamp book, and some valuable stamps (he’s really into stamp collecting! If anyone sends me mail, I’m obligated to give the stamps to him). On Saturday, we went to his favorite restaurant for lunch, Bar-B-Q, and had some of the most amazing Chinese food I’ve ever had! We had soup, wontons, some vegetable and pork heavenly mixtures. I even tried eating with chopsticks, and didn’t do too bad. It was nice to have a family lunch. Afterward, Brynn and I went out to meet some Indian friends afterward, and we just went to a shopping center (seems like some of the friends we made just really like to shop in their free time). It’s nearby our house and has lots of crafts – I think I’ll go back and pick up a few things that caught my eye. On Saturday night, we went to the only place we’ve heard of that serves beef! It’s a bar called Olympia, but it’s called OlyBar for short. Everyone really wanted to try it to see what it would be like – and I quickly changed my mind about getting it once we got there. This bar was really gross. It was a grimy dingy hole-in-the-wall place with a funky smell that will make you lose your appetite. Plastic chairs for seating, and a cat hanging out on the second floor…which is fairly typical for some places in India, but combined with the gross smell and the wripped up carpet and water served in old whiskey bottles…I was not inclined to eat anything. I just had a beer and some French fries – and I was really glad I didn’t order the “steak.” I had a bite of someone else’s and it was gross – definitely not the right texture and not tasting good. Some people thought it was okay…but I’m glad I didn’t order it. UGH. We went to this big music festival on Sunday, the Sufi music festival. There were artists from all over India and other countries. It was nice that there were big screens out in the field, which meant I could sit farther away (with my very sensitive hearing…if I sit too close, I will get sick with an awful migraine) and still see the singers. Nearly everyone in our group went, which was a lot of fun – and we all ended up staying over at Danny and Michael’s house! Since the music festival was in Salt Lake (about an hour or more away with traffic), we were not so inclined to have to leave the festival early to get home. I think the original idea was for it to be a Super Bowl sleepover, but that idea faded as soon as we realized it would be at 3am for us and we didn’t have a reliable way to watch it. Instead, we had a little rooftop party and it was a lot of fun! Monday was a low-key day. We were tired from our sleepover, so we were glad we just had 2 periods of class. Class was not very interesting. The lecture style is just not engaging. And Elizabeth got called out by the teacher in class for eating a little bit of her sandwich. The teacher was surprised to learn we are able to have snacks at CSB/SJU, but just wanted to inform us it’s not acceptable here. The students are really not treated like adults here, and it’s very hard to get used to. After class, we relaxed by watching Mulan – which was great! I spent the rest of the night filling out applications for on-campus jobs for next year (what?? how am I already applying for stuff for next year, my SENIOR year??). Tuesday was a Hindu festival called Saraswati Puja, so we didn’t have school. It’s a festival that celebrates learning and the arts, though you are not allowed to study and classes are cancelled (oh, India…). There are huge celebrations with worship of an idol of the goddess Saraswati. This day also marks the beginning of spring, and yellow is a very auspicious color. Arundhati brought us to a family friend’s house, and we got to wear a sari!! :) It’s really fun to wear one – but they are so complicated to wrap and wear! I definitely wouldn’t know how to put one on by myself. I uploaded a video onto Facebook to show everyone how it’s done! You wear a short lightweight skirt underneath, called a petticoat, and the fabric is folded, tucked, and pleated into this petticoat and arond the body. One of the servants, Bijoli (we love her!) helped us, and she pinned it in a few spots, which helped a LOT. I would like to buy a sari at some point, but I would need to practice a LOT before I would be able to put it on without help. Brynn went to a ceremony with a friend, and Elizabeth, Ashley and I went with Arundhati and Vinayak to their friend’s house. The house is unique – they have converted the whole first floor to a big studio that can be used for music and dance and other arts (the family is really into the arts). 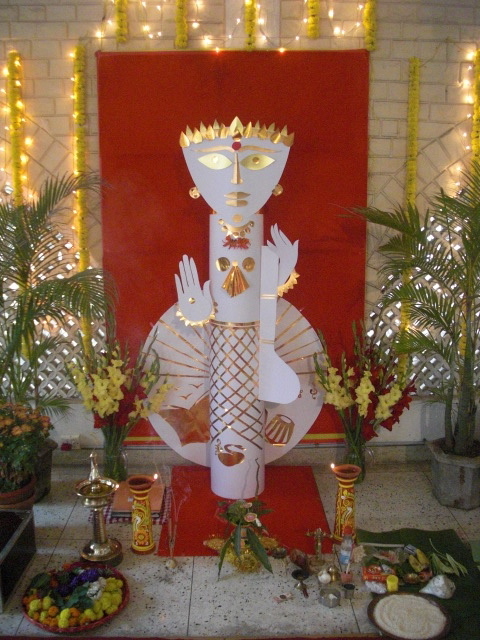 There was an idol of Saraswati made out of paper (atypical of idols) and we were able to watch/participate in the puja. I didn’t understand a lot of it, but Arundhati explained some of it to us. There was a lot of chanting and offering flowers (marigolds are always used in religious ceremonies here). They also burned incense and used the smoke to bless themselves. We ate food afterward, and drank some of the holy water. It was very interesting to see, and I really don’t have anything to compare it to in my religious background. After that, it was a bit boring but I chatted with Vinayak. We didn’t do much after we came home, just relaxing and reading – and I am really loving The Omnivore’s Dilemma! On Wednesday, we also didn’t have class. I’m not entirely sure why, but I think it was part of Saraswati celebrations. We got up early for a small excursion Madhu had planned – a boat cruise down the Hooghly river. It was pretty nice – the river wasn’t as polluted as I was expecting, as it’s a tributary of the Ganges, but it’s still incredibly polluted. It was pretty relaxing – I even dozed off a little bit. We pulled over after a few hours and got off at Belur Math, the headquarter of the Ramakrishna Mission. It was founded by Swami Vivekananda, who practiced a number of religions and came to the conclusion that all religions are true and there is no one path to get to God. We saw a few temples before getting back on the boat. There was nothing planned after the boat ride, so a few of us walked to the nearby Eden Gardens and played cards for a little while before heading home. Yesterday, we decided to take advantage of our free morning before our classes at 1pm, and went to Loreto. We were told we can just go to Loreto whenever now, but the staff was not expecting us to come. We were told we could go upstairs to the Rainbow room where the Rainbows were being tutored – and so far I have not enjoyed that experience so much. Some of the older students come and tutor the Rainbows, who don’t speak very much English. I only know a couple words in Bangla, so I can’t participate in the tutoring so much…so I end up sitting there and watching. It’s not very fulfilling to me – I would prefer to do something that would actually help. I ended up sitting next to 3 little girls who didn’t have a tutor – and they were being pretty rowdy. They were okay at first, but got rowdy to the point of hitting each other. I know no Bangla to tell them to stop and behave, so all I could do was say “nah” (no) in a stern voice with stern looks. It was not all that effective, and the time passed very slowly and I was getting frustrated, but I knew these children really needed attention. Soon after, they were all asked to assemble and went off to other classes, and we were left with nothing to do. We finally found Sangeeta, our coordinator, who was flustered as always but finaly found a job for us – to watch a class of 6-yr-olds. Apparently the teacher (and others) was not there, for whatever reason, so several classrooms were there unsupervised. When we came in, they were all working more or less quietly on a worksheet about numbers. They all called us “Miss” – “Miss, may I use the toilet?” “Miss, may I drink water?” It was going well, up until break time, when they had a 20-minute break to eat and play and they came back very rowdy. They wouldn’t sit down, it was difficult to get their attention, and they knew we didn’t know what we were supposed to do with them anyway. We tried teaching them “Head, Shoulders, Knees, and Toes” with some success before we had to leave. I hope they don’t have many days very often that teachers are missing. After Loreto, we had another unengaging sociology class and Madhu’s class was more asking questions about logistical things. After class, we had to go renew our internet data card, and it was an ordeal. We had gone the day before, but the man didn’t really understand and told us to come back the next day. When we came back the second day, they said we couldn’t recharge our card there but had to go to another store nearby, and once we arrived there he said he could only recharge one! It’s always something here. After a bit of confusion, we finally got them recharged. Hopefully next month will be easier. Today was just a bit of our society and history class – talking about the ideology of “the West” versus “the Rest,” and how India made modern Britain. It was very interesting to hear “the West” from the other side – the perspective we are not taught or exposed to. It makes for some very interesting discussion, and I’m glad to be challenged in my views of the world. I’m starting to learn how much of an impact India’s history of colonization still has today. This weekend, we are going to Shantinikaten! It’s a village community outside of Kolkata, and our family is coming along with us. It’s a huge cultural center, and is known for being the place of Rabindranath Tagore – India’s most quoted author. This man was incredible – a poet, playwright, novelist, essayist, composer, and painter – who won the Nobel Prize in literature in 1913. He wrote the national anthem, and also Bangladesh’s national anthem. I honestly think I hear someone quote him or talk about him every day – they are very proud of him. I haven’t read any of his works yet, but it’s only a short matter of time. And, my newest piece for the Lost Girls is up! 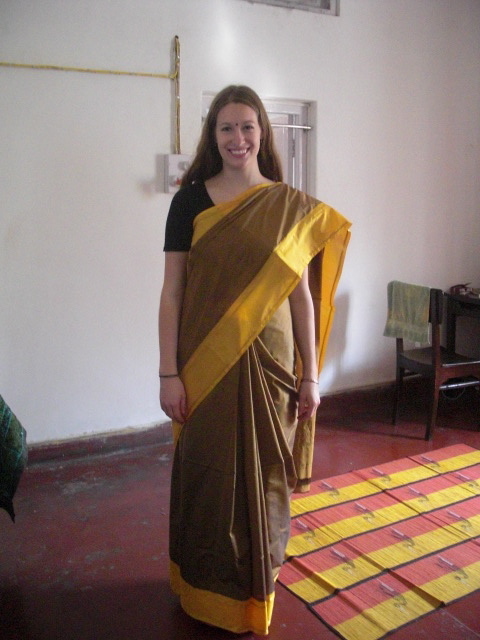 Check it out: What to Wear in India: 5 Tips for Travelers. Should we send stamps for Vinayak?